This axe is constructed of J2 420 stainless steel with an etched basket weave pattern on the blade. 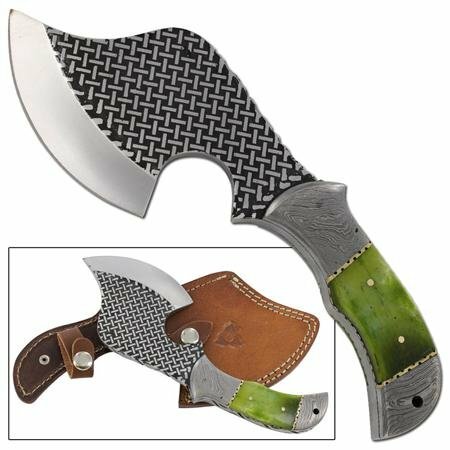 The handle is elegantly designed with kelly green stained bone, brass pins, spacers, and Damascus bolsters. This hand held axe was built for long lasting durability with a thick 6mm blade and full tang construction. Included is a tooled leather sheath with belt loop. Overall length is 9.50 inches.